COMMERCE, OK. — MLB great, Andre Dawson, has been named the guest speaker at the upcoming 2015 Mickey Mantle Classic awards banquet scheduled to take place on April 5, 2015 in Commerce Oklahoma. The wooden bat tournament will be held April 6-11, 2015, at the baseball park that honors “The Commerce Comet” Hall of Famer Mickey Mantle. Source: Jim Ellis, The Miami News Record. 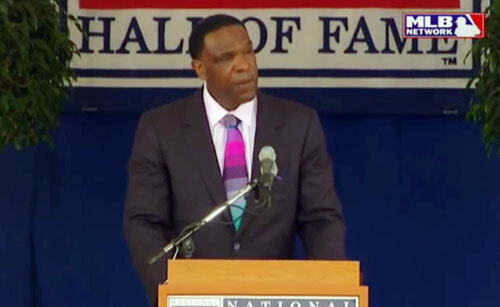 Photo shows Andre Dawson speaking at his 2010 Hall of Fame Induction ceremony. Dawson, who finished with 438 home runs and 314 stolen bases during his 21-year career, was inducted into the Baseball Hall of Fame in 2010. He is the first Hall of Fame member to appear who hasn’t been a pitcher. Past speakers include pitchers Gaylord Perry, Juan Marischal, Goose Gossage, Ferguson Jenkins and Rollie Fingers. Andre Dawson played for the Expos, Cubs, Red Sox and Marlins. His stardom rose in 1977 when he became an everyday outfielder for the Expos, batted .282 with 19 home runs and 21 stolen bases and was awarded the National League Rookie of the Year. Dawson had a blend of power and speed, hitting at least 20 home runs and stealing at least 20 bases in his seven seasons with the Expos. Dawson, playing primarily centerfield, also became an excellent defensive player and won the first of eight Gold Glove awards in 1980. He retired after 21 years. Sports Speakers 360 is a booking agent for pro athletes. If you would like to book Andre Dawson for a speaking engagement, appearance or endorsement, contact Andre Dawson’s booking agent for fees at 1.855.303.5450.